Wander down the path to a Winter Wonderland. 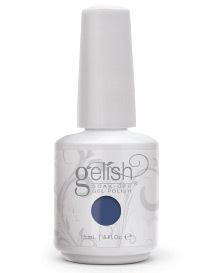 After completing your Gelish nail prep, apply a thin coat of ICE QUEEN ANYONE? to the entire nail making sure to cap the free edge. Cure for 30 seconds in the 18G LED LIGHT. Repeat for full coverage. With FLIRT IN A SKATING SKIRT and a GEL STRIPER BRUSH draw a swirl design onto the nail; do not cure. 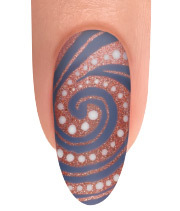 Next, use the Harmony MARBLING TOOL and etch out a line in the center of the swirl design. Cure for 30 seconds. 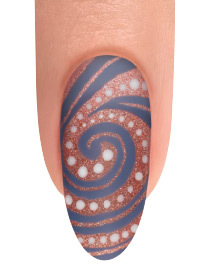 Using ARCTIC FREEZE and a marbling tool add in dots around the swirl design. Cure for 30 seconds. Apply TOP IT OFF to the entire nail making sure to cap the free edge. Cure for 30 seconds. Using NAIL SURFACE CLEANSE and WIPE IT OFF lint-free wipes, cleanse the inhibition layer of the nail. 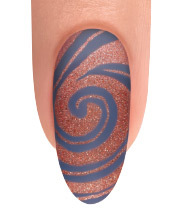 Finish your look by massaging NOURISH CUTICLE OIL into the skin surrounding the nail plate. Enjoy your finished look.